First of all, condolences and prayers for Pat Ward's family and supporters. This loss would be painful at any time; to have it happen three weeks before the election, amid the already intense emotions of campaign season, adds another layer to the hurt. 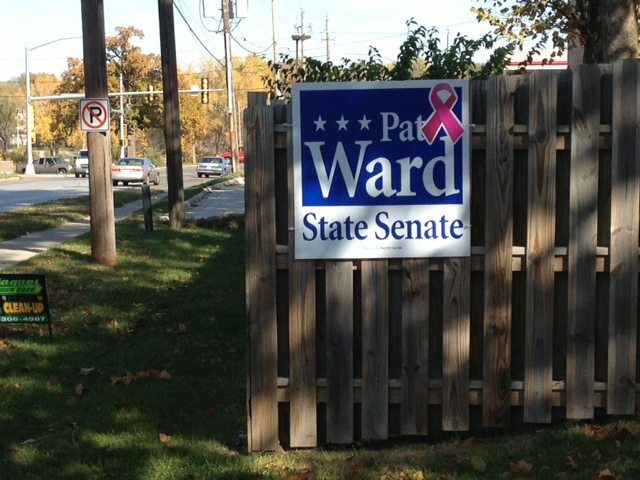 The pink ribbons on Ward's signs, a tribute to her struggle with breast cancer, are especially poignant now. I feel a little like a ghoul for talking about it, but the death of any political figure has political consequences. Ward was a suburban moderate Republican, one of the few left in the Legislature, who had fended off a strong primary challenge from fundamentalist minister Jeff Mullen 58-42. Despite strong GOP numbers in the district, she faced a serious challenge from Democrat Desmund Adams, who announced he was temporarily suspending campaign activities after the news of Ward's death. Iowa law is prepared for this sad contingency, and Craig Robinson did the work of posting the code section. There will be no race to reprint ballots in Polk and Dallas counties. The other races will be counted and canvassed but Senate 22 will not - "SHALL not," the law says - be counted. Instead, there will be a special election on a date certain: December 11. Any candidates on the ballot, except the deceased, automatically appear on the December ballot. This means Adams will be the Democratic candidate, and there will be no third party or independent contenders since there were none for November. Republicans will hold a nominating convention, as they did for several open ballot slots earlier this year. The convention voters will be county central committee members from the district... meaning whoever stayed late enough on caucus night, and we all know how that turned out at several other conventions this year. Announcements will no doubt wait at least until services are completed. I know little of internal GOP suburban politics but I do know that Mullen is in an awkward spot. He's clearly ambitious, but he trashed Ward hard in the primary AND was rejected by the voters. Will that matter to the central committee diehards? This creates a possible overtime period for the general election, if Senate control is in the balance. The district's numbers and demographics favored Ward, but Adams is a strong candidate, and the possibility/likelihood of a less moderate GOP nominee could improve his chances. It also means all the state's political resources could be focused on one-fiftieth of the state for five weeks of absentee ballot drive and field work. Democrats do well in those contests, but will they, or Republicans for that matter, have it in them so soon after the presidential? That answer can wait.